Since 1950 the average surface temperature has risen 0.7C globally and 0.9C in Australia. The climate is also now more variable. There are fewer cold days and cold nights and more hot days, hot nights and heatwaves. Heavy rainfall events have increased in frequency. Rainfall has increased over northwest Australia while eastern and south-western Australia have become drier. These changes suggest a need for growers to alter their practices to minimise the risks and impacts presented by the changing climate, as well as to take full advantage of any opportunities these changes might bring. Global atmospheric CO2 levels have risen since pre-industrial times from 280 parts per million (ppm) to a current (2013) level of 396 ppm. 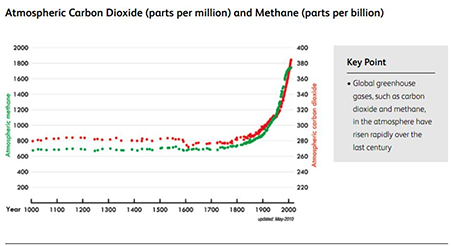 Methane, an even more potent greenhouse gas, has also increased markedly (CSIRO, 2010). Faster growth rate due to more efficient photosynthesis. The challenge for the Australian vegetable industry is to develop a clear strategy for how to adapt to climatic and atmospheric changes in a way that minimises adverse financial and environmental impacts and takes best advantage of any positive changes.